HARTSVILLE, S.C., May 29, 2018 (GLOBE NEWSWIRE) -- Sonoco (NYSE:SON), one of the largest diversified global packaging companies, today announced it has signed a definitive agreement to acquire the remaining 70 percent interest in the joint venture of Conitex Sonoco for approximately $133 million in cash. 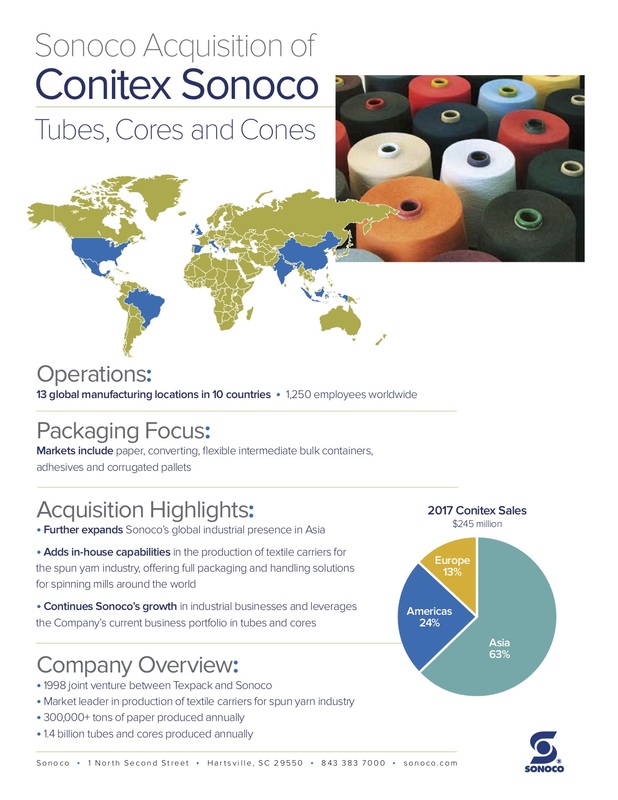 Conitex Sonoco is a vertically integrated, global leader in the manufacture of paper-based cones and tubes used in the textile industry. The transaction is subject to normal international regulatory reviews and is expected to close in the third quarter of 2018. The Conitex Sonoco joint venture was formed in 1998 between Texpack, Inc., a Spanish-based global provider of paperboard and paper-based packaging products, and Sonoco’s former North America textile cone business. 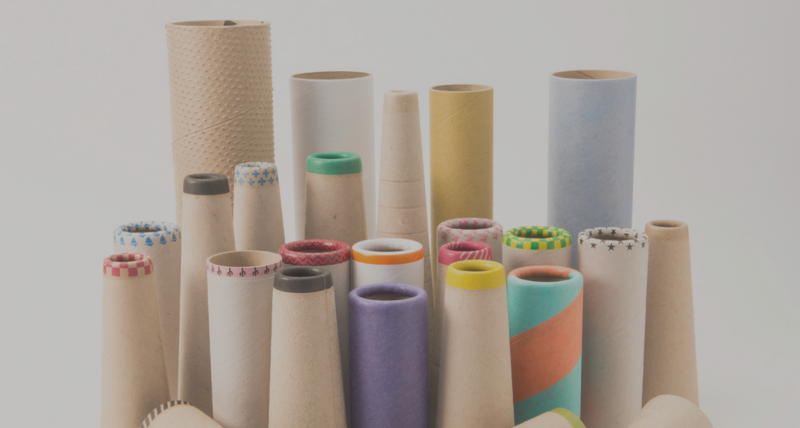 In 2017, the joint venture had total sales of approximately $245 million and produced more than 300,000 tons of uncoated recycled paperboard, which was used to produce approximately 1.4 billion tubes and cones for the global spun yarn industry. The company also produces adhesives, flexible intermediate bulk containers and corrugated pallets. The joint venture has 13 manufacturing locations in 10 countries, including four paper mills and seven cone and tube converting operations as well as two other production facilities. “The Conitex Sonoco relationship has been very successful over the past 20 years, and we see even further opportunity to grow Sonoco’s existing global paper-based tube and core business through this combination, especially in faster-growing emerging markets in Asia where we will be substantially increasing our manufacturing presence while more than doubling our current annual sales in the region,” said Rob Tiede, Sonoco president and chief executive officer. The acquisition of Conitex Sonoco will be modestly accretive to Sonoco’s earnings in 2018. Conitex Sonoco’s Chief Operating Officer Michel Schmidlin and members of his global leadership team will remain with Sonoco, and there are no expected changes to customer relationships. When the transaction is completed, Conitex Sonoco’s financial results will be reported within Sonoco’s Paper/Industrial Converted Products segment. Founded in 1899, Sonoco (NYSE:SON) is a global provider of a variety of consumer packaging, industrial products, protective packaging, and displays and packaging supply chain services. With annualized net sales of approximately $5 billion, the Company has 21,000 employees working in more than 300 operations in 33 countries, serving some of the world’s best known brands in some 85 nations. Sonoco is committed to Better Packaging. Better Life., and ranked first in the Packaging sector on Fortune’s World’s Most Admired Companies 2018 list. For more information, visit www.sonoco.com.